Grapevine wreath inspiration are a gorgeous addition to your Easter home this year! Easter is coming and you are probably thinking of one or two cute craft ideas to decorate your home for the holiday. Well, our Easter bunny grapevine wreath is sure to get your creative juices flowing! 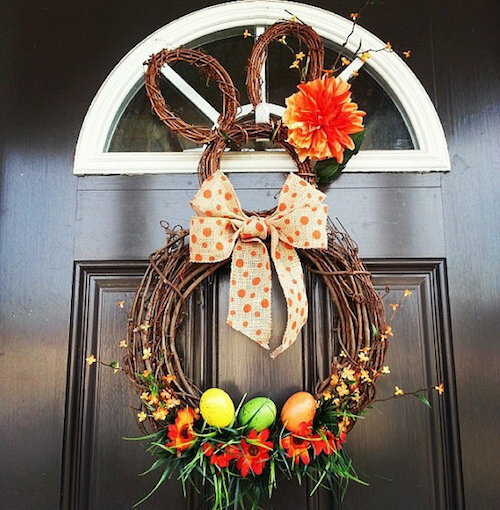 Crafting this Easter wreath may take up a bit of your time but the wreath looks very adorable and makes you happy every time you walk by it. Hang the wreaths by the kitchen table, in the foyer, or over the mantle, they will look great everywhere. Wire the large 10-inch wreath and the 8-inch wreath together. Bind them tightly and secure by twisting the wire into a knot. It will form the body and head of the bunny. Now, it’s time to make the ears, probably the most difficult part of this project. 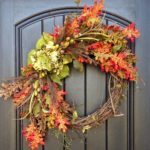 Take one 6-inch wreath, squeeze both ends until the ends crack a bit and start forming a pointed shape. If needed, bind both ends with brown wire to keep the wreath in this shape. Follow the same process for the second wreath. The ears of your bunny are ready! Attach the two ears to the top of the 8-inch wreath with wire. After that, wire all the forms together until the entire wreath seems secure and each part is tightly attached to one another. Twist the leaf vine and wired daisies lengths around the wreath and glue wherever it is needed to keep them attached to the frame. Hot glue the plastic eggs at the bottom part of the 10-inch wreath. Make a bow with the ribbon and glue it to the ‘neck part’ where the 8-inch wreath meets the 10-inch wreath. This bunny grapevine wreath is one of the cutest Easter wreath ideas that you can imagine. You can craft it without much hassle and the supplies are cheap! What else you can ask for a wreath crafting project? Remember to grab enough supplies if you want to dole out one or two to your guests or relatives. 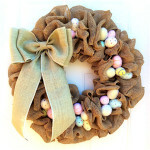 For more Easter wreath ideas, search our Easter wreath category. This might be the cutest wreath I have ever seen! 🙂 So clever. Celebrate Your Story link party. Here is the link: http://www.thesweetsensations.com/celebrate-your-story-link-party-is-moving/. I hope you can join us and have a fun week! Would love to see your finished bunny wreath. Did you mCute bunny wreath. Did you make one too? How adorable! You are so creative. 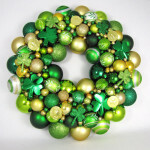 I agree with Erin above, this is the cutest wreath ever! These are so cute! I think I still have enough time to get one of these made up for my front door before Easter. I love these, they are so cute! I especially like the decorated ones- so colorful for spring!